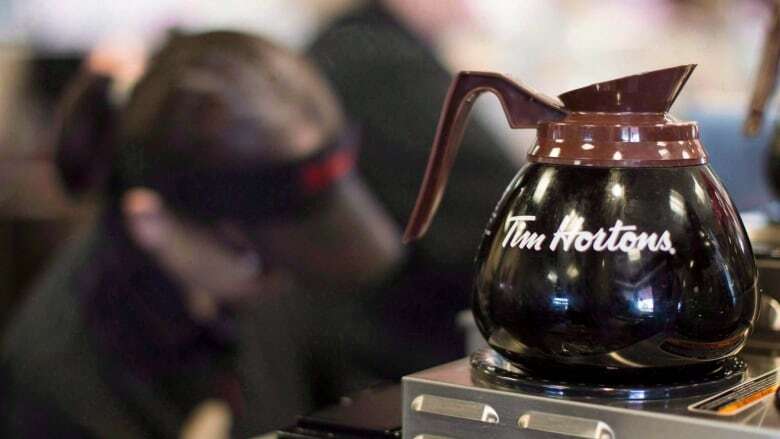 The parent company of Tim Hortons seized ownership of four locations from a restaurant owner heading an unsanctioned franchisee group after he allegedly leaked sensitive corporate news to the media. The president of the Great White North Franchisee Association, which has served as a thorn in Restaurant Brand International's side since its inception more than a year ago, denies the allegation he's acted as an anonymous source and claims the company is yet again attempting to intimidate franchisees. "Unfortunately, by the time I got there, security people had locked the doors. We weren't allowed in," he said. "The Tim Hortons franchisee agreement clearly states it is not allowable for any restaurant owner to share confidential company information with the media; disparage the company or the Tim Hortons brand in the media or with community partners and vendors; or ultimately harm the Tim Hortons brand in any way," wrote spokeswoman Jane Almeida in an email. The company's decision has nothing to do with Hughes's position with the association, she added. Last week, The Canadian Press received a copy of a letter from the franchisee group's lawyer to the head of legal at the coffee chain alleging coffee pots have been shattering and injuring employees. RBI denied the accusation, as did the manufacturer. Almeida declined to respond to questions about whether RBI believes Hughes leaked the letter, other information or both. "Besides our original statement, we have nothing further to add," she wrote. Last year, RBI accused Hughes and association board members of leaking confidential information to the former chief executive officer of Tim Hortons, who then provided it to one of Canada's national newspapers. Hughes, the association and the former CEO all denied the accusation at the time. Hughes denies leaking any information to the media, saying this is the first time he's been allowed to speak with a journalist "forever." Hughes last spoke to the Canadian Press in 2017. Still, he's been outspoken about RBI's alleged mismanagement of the coffee-and-doughnut chain. He's critiqued the high cost of new espresso machines, for example, and accused RBI of trying to intimidate franchisees — a claim the company has denied. "Sometimes we agree and sometimes we don't, but we have no tolerance for any owner that knowingly damages our brand," she wrote. It's unclear if Hughes, who once vowed to be the last man standing in the battle against RBI, will remain president of the association, which did not immediately respond to a request for comment. The group's bylaws won't allow him to remain president if he owns zero stores, he said. Though, for now, Hughes remains in the role and is consulting with the group's legal team to determine his next steps. "We're going to fight this, obviously," he said. "Because what they're trying to do is get rid of the president of the Great White North. This is just pure intimidation."